David Tannenberg left no complete list of the instruments he built, so we are left to construct such a list based partly on the amazingly detailed diaries written by the Moravians and historical research in church archives and historical societies. Quite a lot of information has been lost but enough remains to construct the list below. Much of this work was accomplished in the early 1960's by William Armstrong as research for his book, Organs for America: Life and Work of David Tannenberg. Additional work was done in the late 1980's by Raymond Brunner in preparation for his book on the Pennsylvania-German organ, That Ingenious Business. The possibility is fairly high, however, that there were other organs built by Tannenberg that, for some reason, were not recorded by the Moravian diarists. Also, whatever information which might have at one time existed in various church records on such organs has been lost. It is worth noting that quite a few churches in Pennsylvania had organs where the builder is not now known. Emanuel Lutheran Church in Brickerville and Trinity Lutheran Church in New Holland, for example, both had organs at an early date. The following is a listing of the known organs David Tannenberg built in his nearly 40 year career. Additional research might reveal not only more accurate dates in those cases where the date of construction of an organ is not known exactly, but also additional organs that are not presently known. 1765 - Moravian Church, Lancaster, PA - This was probably a 3 or 4 stop organ as its cost was £50. It was built for the chapel in Lancaster and was used for the first time on April 22 with only one stop playing. 1765 or 1768 - Moravian Church, York, PA - This organ had 3 stops and possibly a pull-down pedal. 1766 - Philadelphia, PA - The Philadelphia Moravian records diaries mention that this organ was for "a man here in the city". 1767 - Albany, New York - Possibly for the German Reformed Church in Albany which was reportedly the first church in that town to have an organ. The Lititz Moravian Diary mentions that Tannenberg returned by way of New York City after having installed an organ in Albany, NY. 1768 - A Church in Lynn Township, PA. - There exists some confusion as to whether this organ was for St. John's Union Church in Kutztown or for one of the churches in Lynn Township. The Lititz Moravian diary recorded that Tannenberg traveled to Maxatawny with a new organ on November 22, 1768. However, he would probably have traveled to Maxatawny in order to get to Lynn Township. 1769 - New Goshenhoppen German Reformed Church, East Greenville, PA - This organ was used until 1869 when it was replaced by an organ by Edwin Krauss. Parts of the case are stored in the church attic. 1770 - German Reformed Church, Frederick, Maryland - Apparently, this involved the repair and setting up of an already existing organ. 1771 - St. Michael's Lutheran Church, Philadelphia - Rebuild of the 1751 Johann Adam Schmahl organ. On November 12, 1771, Tannenberg was paid £54.12.0 for "repair" of the organ in St. Michael's. This was too large an amount to be a simple tuning. Tannenberg may have possibly modified the instrument in some way - possibly adding a stop or two. This organ was replaced by Andrew Krauss in 1815 who may have used some of the Schmahl pipes or parts in the building of his new instrument. 1772 - No information as to the place for which this organ was constructed. 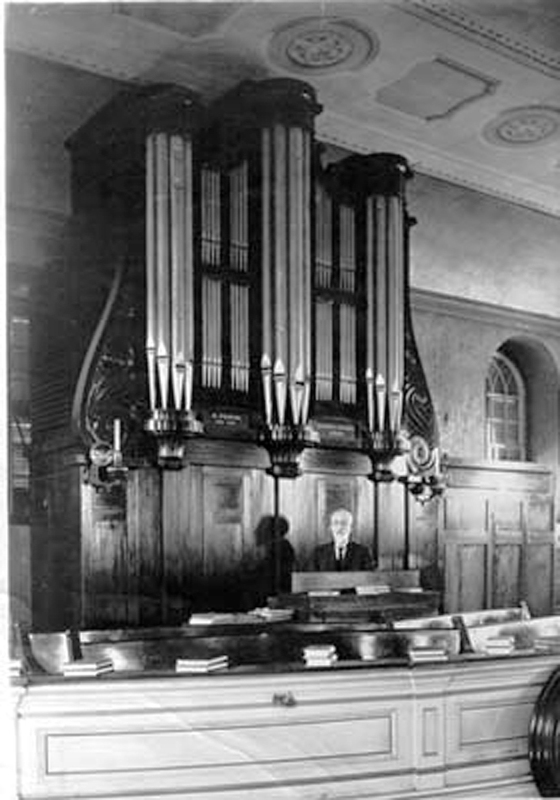 The Lititz diaries mention that many people came to see and hear Brother Tannenberg's newly made organ. 1773 - Moravian Church, Lebanon, PA - This was probably a 4 stop organ as its cost was £45. The organ was used for the first time on November 14. The church and the organ were both destroyed by fire on July 29, 1858. 1775 - St. Mary's Roman Catholic Chapel, Lancaster, PA - This was a 4 stop organ for the congregation's 1762 building. The organ was sold to the German Reformed Church in Lancaster in 1798. In the early 20th century, the organ was removed from the case. 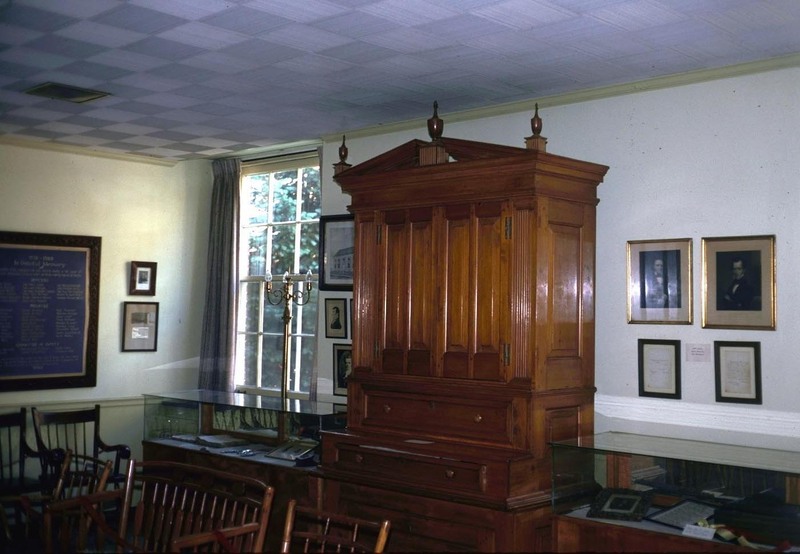 The case, stripped of its white paint, is still located at the Reformed Church. For a photo of the case, click here. 1775 - Lutheran Church, Frederick, Maryland - This organ cost £400 which might indicate that this was a sizable organ - possibly a two manual with a pedal. There are conflicting accounts of the history of the organ. One account states that it was replaced by an organ built by Adam Ault in 1825. Another states that the Tannenberg organ was sold to a church in Ohio in 1855. There is some indication that Adam Ault rebuilt the Tannenberg which was then sold in 1855. 1777 - Single Brothers' House, Lititz, PA- This was probably another 4 stop organ as its cost was £50. It was played for the first time on August 30. 1780 - Residence of Mr. John Fischer, York, PA - John Fischer was a clock maker and portrait painter. He was also a member of Christ Lutheran Church. Mr. Fischer died in 1808 and it is not known what happened to the organ. 1782 - Moravian Chapel, Hope, New Jersey - The organ was used for the first time on November 8. The Moravians left Hope, New Jersey in 1808 and nothing is known about what happened to the organ. 1783 - Hagerstown, Maryland - The Moravian diaries recorded that Tannenberg and one of his sons left Lititz to install an organ in Hagerstown. St. John's Lutheran Church built a new church in 1770 and the German Reformed Church built a new church in 1774. St. Peter's ("Beard's") Lutheran Church also had an organ at an early date. Either of these three churches are likely possibilities, but St. John's Lutheran Church has in their possession a subscription list for an organ dated 1782 making this the most likely possibility. 1784 - German Reformed Church, York, PA - The church and the organ were destroyed by fire in July, 1797. 1786 - Union Church (German Reformed & Lutheran), Egypt, PA - It is likely that this was a six stop organ similar to the 1791 organ Tannenberg built for Zion Lutheran Church in Spring City. The cost of this organ was £145. It was replaced in 1869 with a new organ by Charles Heintzelman. By 1795 - German Reformed Church, Philadelphia, PA - The date of this organ is uncertain. The Moravian historian, Abraham Ritter mentions the Tannenberg organ in a 1795 description of the church. It was replaced in 1836 with a new organ by Henry Knauff. 1795 - St. John's Union Church (German Reformed & Lutheran), Kutztown, PA - There exists some confusion as to whether this organ was for St. John's Union Church in Kutztown or for one of the churches in Lynn Township. The Lititz Moravian diary recorded that Tannenberg had returned from setting up an organ in "Guts'town". This was probably for St. John's Union Church in Kutztown. Their new building was constructed in 1791. 1796 - Zion Lutheran Church, Baltimore, Maryland - The cost of this organ was £375 which may indicate this was a mid-sized organ. In 1808, it was moved to the church's new building where it remained until the church caught fire and burned on March 30, 1840. By 1798 - Union Church (German Reformed & Lutheran), Tohickon (Bedminster Township) - Tannenberg installed an organ sometime prior to 1798 in this Bucks County church. It was there in February of 1798 when John and Andrew Krauss visited it. The organ was rebuilt in 1839 by Andrew Krauss who provided a new case. In this condition, the organ survived until 1918 when it was replaced by a new organ by Charles Durner. To see a picture of the organ, click here. 1798 - Single Sister's House, Lititz, PA - This was probably a 4 stop organ as its cost was £50. 1799 - Moravian Church, Lancaster, PA - This organ cost £260 indicating it may have been similar to the 1787 organ for Lititz Moravian Church. It was dedicated on January 20. Central Moravian Church, Bethlehem, PA - Tannenberg proposed to build a 2 manual and pedal organ for Central Moravian Church in Bethlehem in 1803. It was to have cost between £700 and £800. Click on the link to read more about it and see the stoplists.